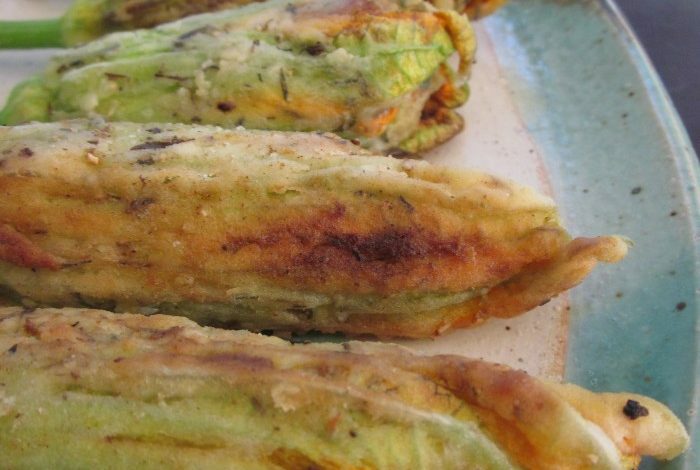 Squash flower blossoms make a great casing and you can fill these babies with almost anything. Other fun things you can stuff them with to come…These are great party appetizers. Great with any type of dip – ranch, blue cheese, marinara and some ice cold beer. Mix the first 6 ingredients together thoroughly. Add additional salt/pepper to taste. Take a large scoop of the cheese mixture and form into a ball in your hand. Dip Poppers into beaten eggs then thoroughly coat in Panko or bread crumb mixture. Fill a large frying pan with oil (olive, canola or a mixture of both) enough to fill the bottom to about 1/8 inch (you do not want them floating). Warm oil to medium heat and sauté poppers until golden brown on each side. Usually takes about 4 minutes per side, then you may have to flip them once more to finish them up. Place on plate with a paper towel to cool and drain any excess oil. The flower makes a great casing and you can fill these babies with almost anything. I’ll post some other fun things you can do with them later. These are great party appetizers. Great with any type of dip – ranch, blue cheese, marinara and some ice cold beer. Enjoy!